I’ve written about both sets of my grandparents numerous times before on this blog. I am really lucky to still have both sets, something which I guess is quite rare really at my age. One set, my maternal set I see all the time and they are my heroes, I am incredibly close to them both and we see them most weeks. My other set, my paternal side, I don’t see anywhere near as much as they live a couple of hours from us, but we do try and see them every couple of months. Anyway I am digressing as usual. I was going to write about something completely different for my ‘Ordinary Moments’ post this week, but as I write this it’s Saturday afternoon and I am just have this overwhelming sense of feeling grateful for what I’ve got. LL is upstairs having a nap and Mads and Mr E are currently playing a game on the rug just in front of me. We had a nice relaxing morning, we just went for a picnic and a bike ride and are now having a lazy afternoon. I get like this occasionally, usually if I am feeling particularly sentimental or over emotional about things, but I get this real feeling of gratitude for the people I love. Our family isn’t perfect. We have our ups and downs, cross words, angry tears or heated disagreements. We have broken families, which does make it harder sometimes. It’s also pretty small, my Mum and Dad only have one sibling each and I rarely see my cousins now we have all flown the nest, but the small family I do have is tight. We love each other through thick and thin and I know my nearest and dearest would do anything for me. And I realise how lucky I am to have that. I feel so grateful to be raising my girls in a family full of love. 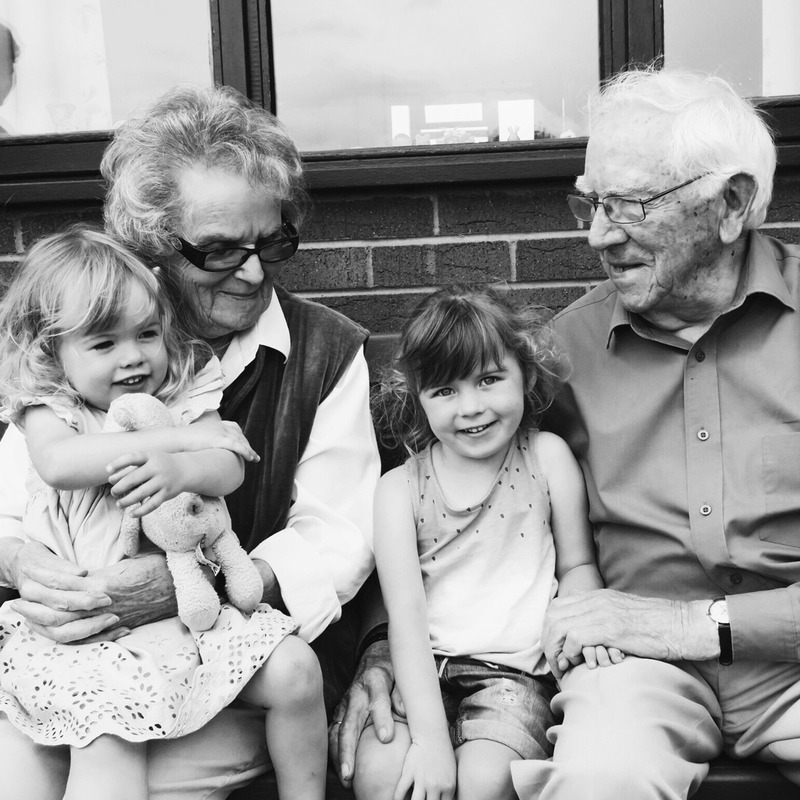 I am the eldest grandchild, meaning that our two little ladies are the first great Grandchildren on both sides, and as such both sets of my Grandparents adore them. I have always been overly emotional, but seeing my Grandparents making memories with my children couldn’t make me any happier- I feel so lucky to be able to have these moments, especially as sadly you never know what life can throw at you. It’s wonderful to watch my Mum and Dad bond with Mads and LL, as I can see what they were like with me at that age. When my Dad goes all soppy and stares at LL or Mads with such love in his eyes, I wonder if he used to do that with me. Or how my Mum is their favourite person ever and the one they always go to for cuddles, just like I did when I was born. It’s the same with my Grandparents as well. On Tuesday we took a detour back from the Peak District to go and visit my Nana and Grandpa. They are 90 and 94 and we arrived to find that my Nana had hidden about 20 teddies around the house for the girls to find. They adored this game, running around seeing where she had hidden them. It gave me the biggest sense of nostalgia. I remember running around their house, with it’s same patterned carpet, old grandfather clock ringing on the hour every hour, and same pictures on the wall, all those years before. Later that afternoon we sat down in the garden to read a book that my Nana had kindly bought the girls. As their eyesight is getting worse, I read it out loud for all of us, a silly tale about a grumpy bear. I looked over at my Nana at one point and she had tears in her eyes listening to the story with one of the girls either side of her. The sight made me feel both desperately sad and also incredibly grateful at the same time. I’m so lucky to be able to experience these moments. Growing old is a funny old thing. It must be really strange and also very sad to think that you won’t ever know what will happen to further family generations down the line. Not to be able to see your great Grandchild get married or know what kind of person they will grow into. It brings tears to my eyes just thinking about it. It’s the circle of life but if I think about it too much it makes me feel so so sad. Myself and Mr E were talking about it afterwards and saying that it was such a shame that I never got to meet his Grandparents- I would have loved to have met them and I would have loved for them to know how happy he was. How we are building our own happy family. How we make each other the happiest. But I guess life itself is a funny old thing. No one can be sure what’s round the corner. So we treasure the extraordinary moments, the amazing times, the holidays and the fun days out. But even more so we treasure the most ordinary ones of all. The teddy bear hunts, the playing board games on the rug on a Saturday afternoon and the way in which tickles makes little eyes shine and dance about in pure innocent happiness. Sure it’s not always perfect- it can be stressful, tough and all those other things in between. But I’m always grateful. Always. The teddy that my Nana is holding was my Dad’s when he was little, he is nearly 66 years old. Mads especially found it fascinating that her Grandpa used to cuddle him when he was little. LL just wanted Baa Baa to give him a kiss! 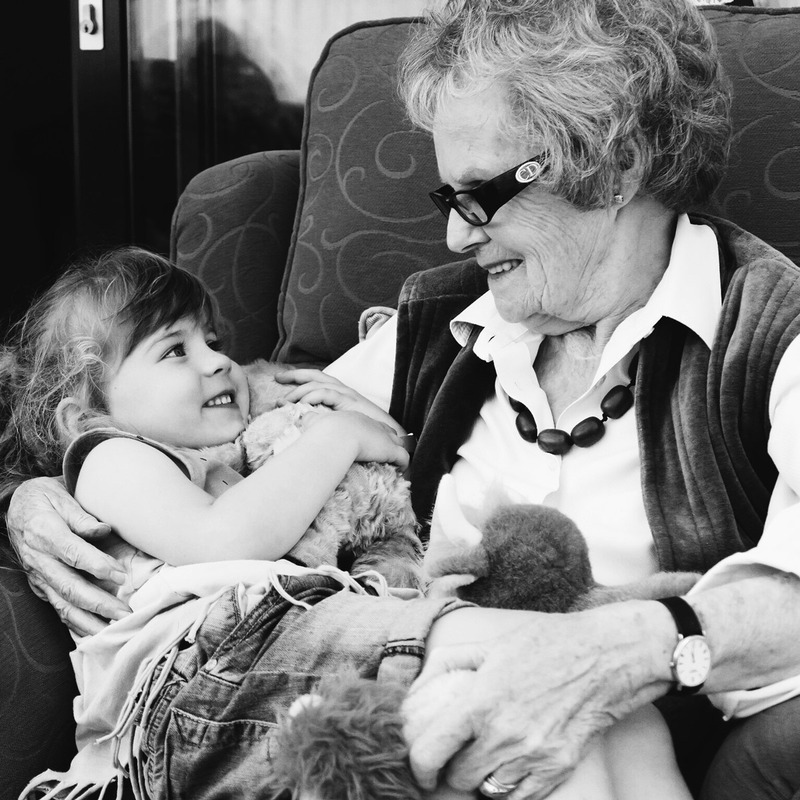 I love this one of my Nana and Mads. That’s how I feel too Beth, there’s not loads of us but I am lucky with the ones I do have. Your Gran sounds fab! Beautiful post Katie. You really are so lucky to have grandparents and the picture you build of your Nana having tears in her eyes as you read is so lovely. I’m grateful that my gran got to meet and get to know Mark before she passed away. I really miss her. 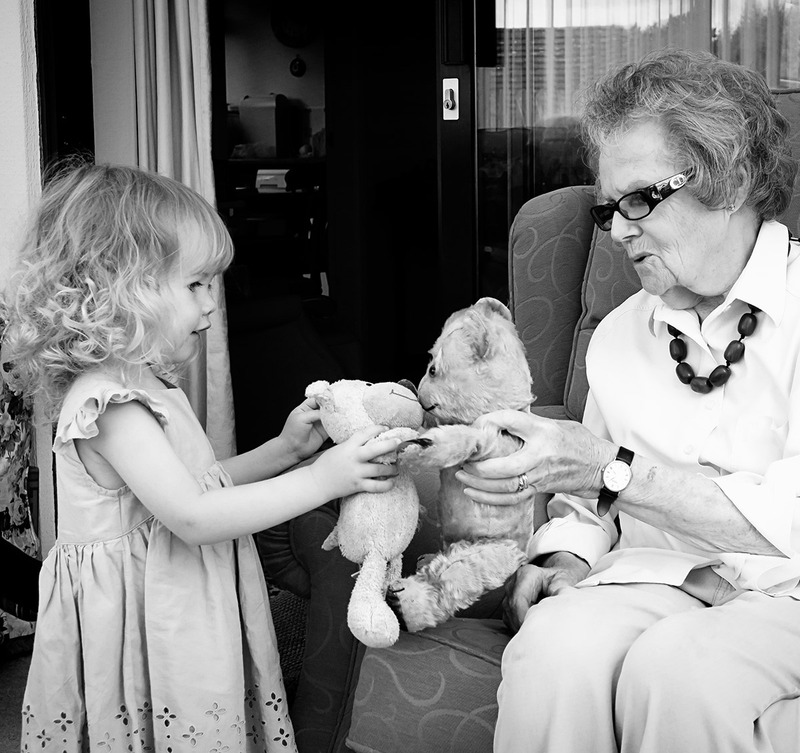 I love the pic with Grandma and the teddies – its lovely and so much fun! Such lovely photos. I think it’s great you and your girls have such a close relationship with your grandparents. My Grandma on my dad’s side is still alive and she regularly visits the kids and they adore her. She now has 7 great grandchildren; 4 girls and 3 boys. I wish my Mum’s mum was her to see my kids but I’m sure she’s out there somewhere watching over us all. It really is strange to think about growing old and all the future generations. I’m sad that we don’t have a boy in our family to carry on my maiden surname as all the children born to my Grandma’s children are girls. Without even saying it you can tell from previous posts how grateful you are. Love literally pours from your family and it really is a beautiful thing. I don’t really have that extended family, and my children don’t outside of Hubby’s wonderful parents but I know that my children will have the foundations to pass this sort of family onto their children – and that makes me happy. I’m grateful I have the opportunity to make a better future for my children.